I loved the first Dredd movie, but it's pretty bad so this excites me. I don't care if it flopped, I loved that movie. I honestly don't know if Dredd can be redeemed...the first movie was so dumb. The Question is: More money = Approve? Yay another effing remake like we don't have enough of those already. Wow... I thought this was just being talked about, didn't know they'd started shooting. Anyway, I liked the first film. Sure it's not perfect, but visually it was extremely accurate, and I even liked Stallone's performance. I just have to say it "I am the law". Could this be the jump up for him? Judge Dredd is pretty much the sole reason for my new gamertag a few months back (JudgementReaper) but apart from that i loved the movie to bits from the actors to the "i am the law!" phrase it was just an awesome movie no matter which way i look back on it. I hope the creator doesn't end up Dredding this decision. I don't care what anybody says. The last movie blew harder than a school of blowfish listening to Hootie and the Blowfish while blowing up balloons on a very windy day. 90% of real Dredd fans will agree and the other 10% need tin foil hats. When I heard Urban was involved my hopes started getting high. And this is high praise From John Wagner. If he says it's looking good then it's looking good. Role on December. Karl Urban is an excellent choice. He also looks just like John Marsden: in case they ever make an RDR movie... which I hope they don't. The GTA movie (Crank) was enough. 1. It pleases me to no end to see that others actually appreciated the first Dredd. 2. It pleases me to no end to see that others actually kept working to adapt Dredd. Somewhere, Rob Schneider must be sobbing onto the shoulder of the Bermuda shirt made of Benjamin's Adam Sandler happens to be wearing this morning, his muffled cries of, "They didn't even ASK me," barely audible through the layers of crisp cash and celebrity entitlement. NINJAS! GWAAAAAAAAH!!! "I knew you'd say that!". OT: The first movie was pretty bad, but fun to watch with all the corniness. But since this one got the thumbs up from the creator, I might actually go see this movie. Just so long as they don't have Rob Schnieder. I do not like Rob Schnieder. Not one bit. I may need to lie down for a moment. Then try to think about Eomer or Bones Mccoy, much better Karl Urban roles. I reserve judgement until we see what the costume looks like. 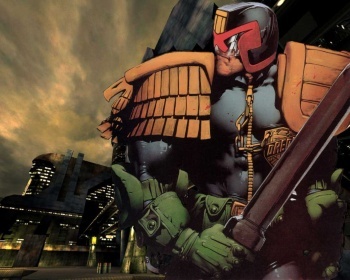 Dredd's outfit doesn't translate well into real life as is. I'd be ok with them changing it.